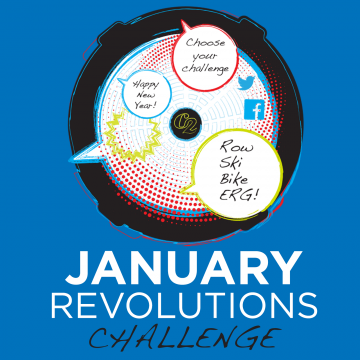 January Revolutions aims to help you kick-start your year. You choose which goal motivates you. Whether you have an indoor rower, a SkiErg or a BikeErg, we hope you'll join us in starting the New Year with a bang! You can choose from time, Calories or consistency—try to workout as many days as possible in January! Each type of goal has two different levels. Select your goal from the Challenges page of your Logbook after December 1. Then all you need to do is enter your workouts in your Logbook as you normally would, and your progress will be tracked on the Challenges page. Unlike most of our individual challenges, you need to opt-in to participate. If you're targeting Calories and you're not used to exercising in Cal/hr, it may help to know roughly how long it will take. A pace of 2:00/500m (2:00/1000m on the BikeErg) is approximately 1000 Cal/hr, so it would take about 10 hours to do 10,000 Calories. A pace of 2:30 is approximately 650 Cal/hr, so it would take about 15 hours. If you're doing The Stretch or The Big Stretch, you need to row at least 500m a day for it to count! Choose your goal from the Challenges page after December 1. Indoor rower, SkiErg or BikeErg workouts only (no on water/on snow meters please). You can combine workouts from each machine. Deadline for choosing a goal: 11:59 pm GMT (6:59 pm ET), January 10th. The option to purchase January Revolution goodies at our third-party fulfillment vendor (availability varies by country).